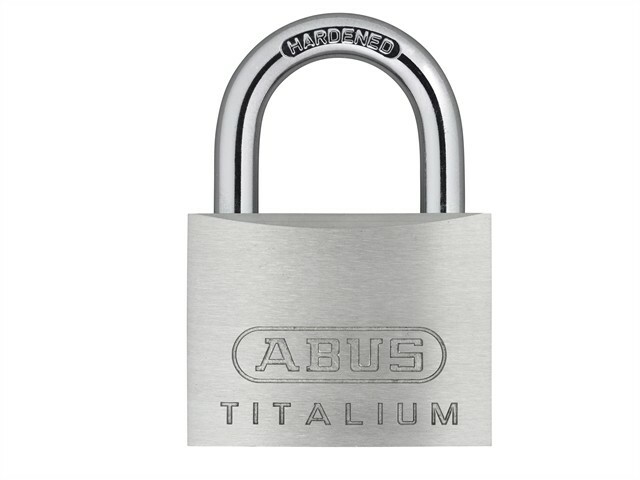 The ABUS 54TI Series TITALIUM™ Padlocks are the entry level padlock of the TITALIUM™ range. They have a solid lock body made from TITALIUM™ aluminium alloy, a mixture of materials is created that is extremely durable and lightweight; similar to the process used in aircraft construction. Fitted with a hardened steel double locking shackle, which resists saw attack, they offer optimum security against lower theft risks. 40mm and above are fitted with a 5 pin tumbler cylinder. They offer optimum security against lower theft risks. Ideal for bags, suitacases, lockers, toolboxes etc.